Rationalization - Subconscious justifications, excuses or reasonings given to make a behavior seem logical -- "A student fails the final he didn't study for and says... "I couldn't have passed it anyway - that teacher has it in for me." 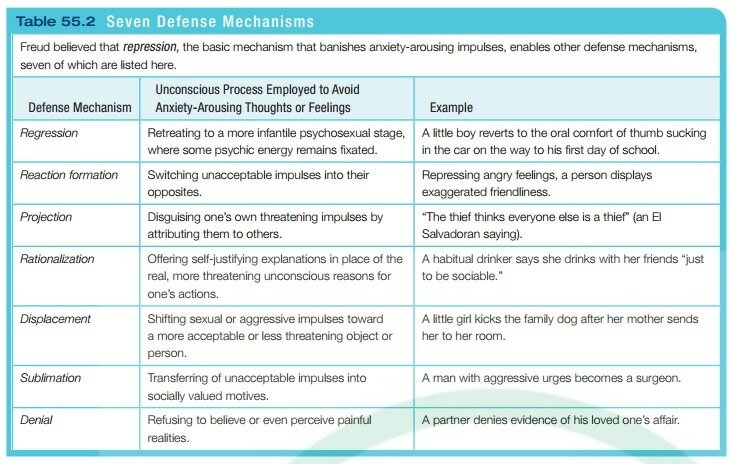 Rationalization is included at the beginning of any list of defense mechanisms because it's so frequently recognized as "being defensive". Projection - Attempts to banish or "disown" unwanted and disliked thoughts, behaviors, and even "parts of self" by projecting or attributing them to someone else. May be as simple as blaming someone else - "He should have let me off on that ticket but that cop was trying to fill his monthly quota." Or as complex as seeing and experiencing a repressed or "disowned" part of self in another person - e.g., an excessively passive person marries an excessively angry person - both experience their disowned "part" in the other. Introjection - The opposite of projection - subconsciously "takes in" to self an imprint (or recording) of another person including all their attitudes, messages, prejudices, expressions, even the sound of their voice, etc. This is healthy if the imprinted material is helpful advice, warnings, or other lessons from parents and respected others -- unhealthy if shaming messages from parents, hatred, or aggression is turned inward on self. Identification - An ability available very early in life that children use to attach themselves to certain qualities, emotions, and attitudes of someone else...especially during the modeling period between eight and thirteen. This helps the child further develop the Adult Ego State and the Parent Ego State. Isolation - Separation of memory from emotion...can remember and talk about the trauma but feels no emotion -- the Person talks about the incident as if it is someone else's story. Accomplished by talking Third Perceptual Position. Sublimation - Redirection of impulses into socially acceptable activities -- normal and healthy, such as when the sexual impulses of adolescence is channeled into sports and competition. Displacement - No list of defense mechanisms would be complete without displacement. This defense reduces anxiety or pressure by transferring feelings toward one person to another -- commonly known as "dumping on" someone...e.g., man is mad his boss and kicks the cat when he gets home, or blows up and yells at his family. Repression - Painful, frightening, or threatening emotions, memories, impulses or drives that are subconsciously pushed or "stuffed" deep inside. It takes a lot of energy to keep material "stuffed"...energy that could be used for more productive living. Healthy if the person does not have the psychological resources available to deal with it. Suppression - Painful, frightening, or threatening emotions, memories, impulses or drives that are consciously pushed or "stuffed" inside. It takes a lot of energy to keep material "stuffed"...energy that could be used for more productive living. Conversion - Mental conflict converted to a physical symptom... e.g., a soldier on being deployed into battle is conflicted about his desire to serve his country but believes it is wrong to kill for any reason develops paralysis, blindness, or deafness with no medical cause. Regression - Giving up current level of development and going back to a prior level... and older child under stress begins wetting the bed or sucking a thumb after a long period without that behavior. In extreme cases of PTSD an adult could regress into a child-like ego-state and curl up in a fetal position on the floor unable to communicate. Reaction Formation - Over-compensation for fear of the opposite. Two conflicting parts of self -- one is strengthened while the other is repressed...e.g., An overly nice and agreeable person may have a lot of repressed hostility and rage of which they are completely unaware on a conscious level. Fantasy - Retreating into a dream world of times past... Can be unhealthy if it happens when action is required instead. Healthy when used to go back and finish unfinished business of the past...or simply for sentiment & nostalgia such exploring high school yearbook or family album. Fantasy is so commonly experienced that many people forget to include it on their list of defense mechanisms.